During the last month’s 2018 Winter Olympics, I was reminded of the similarity of a quote from Pierre de Coubertin (shown below) and the often-cited question posed by Lester B. Pearson in his Nobel Prize Lecture: “How can there be peace without people understanding each other, and how can this be if they don’t know each other? 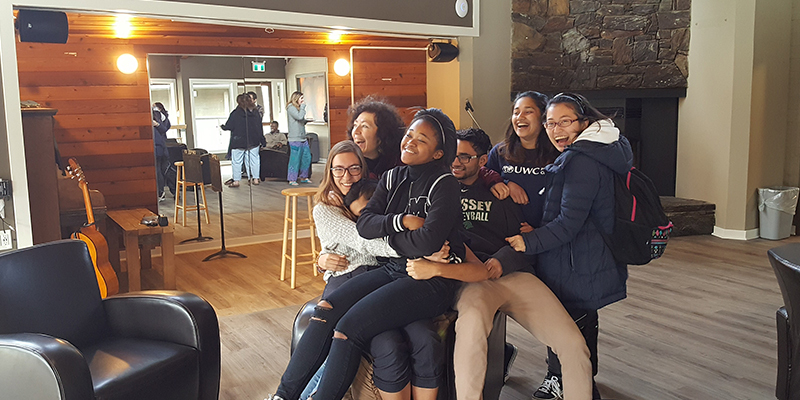 At Pearson College UWC, we foster international understanding by bringing together youth from around the world to live, learn and laugh together. We were honoured that Pearson College UWC students had many opportunities to interact with the personal representatives (known as ‘Sherpas’ in their vernacular) to G7 leaders during their recent (6-7 March) on-campus meeting. 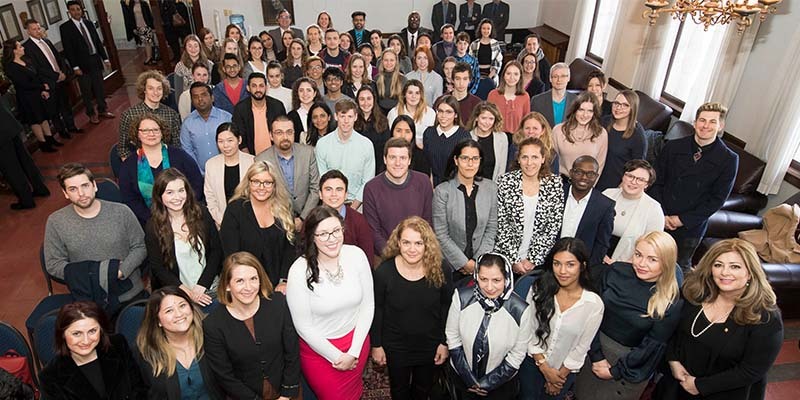 No other pre-university school in Canada – or anywhere else that we are aware of – has had the unparalleled opportunity of directly sharing the concerns of young people from across the globe with these influential officials. Canada assumed the presidency of the G7 at the beginning of this year and will host the Leaders’ Summit of prime ministers and presidents (Canada, France, Germany, Japan, Italy, United States, United Kingdom, European Union) in Charlevoix, Québec in June. We are grateful to Deputy Minister for the G7 Summit and Personal Representative of the Prime Minister of Canada Peter M. Boehm for bringing this meeting to campus and for encouraging his peers from the G7 nations and European Union to listen to, speak with and interact with Pearson students. I am proud that our students took every opportunity to engage with the G7 representatives and that an open and sometimes challenging dialogue was intentionally and honestly brought forward. 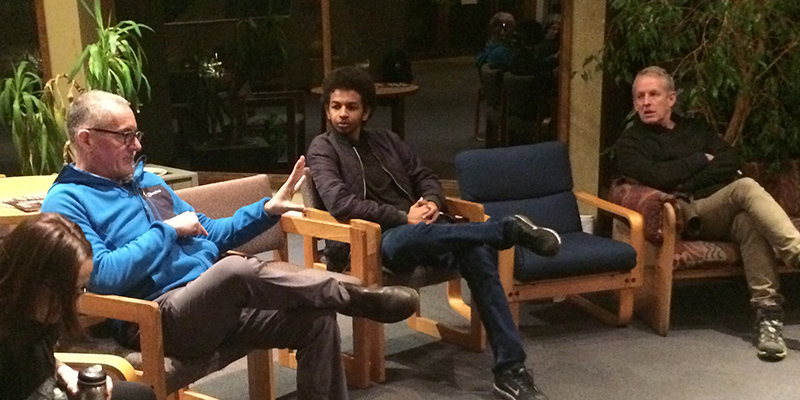 Mr. Boehm led a community presentation and dialogue with Pearson College Students on 6 March. The range and caliber of our students’ questions and comments reflected, as always, the diversity and integrity of our student body – leading him to pronounce this “engagement session” as better than any university group with whom he has met since assuming his role. Our students had a number of other formal and informal opportunities to engage with the delegations. including a session on 7 March when students from G7 countries met with their respective national delegations. 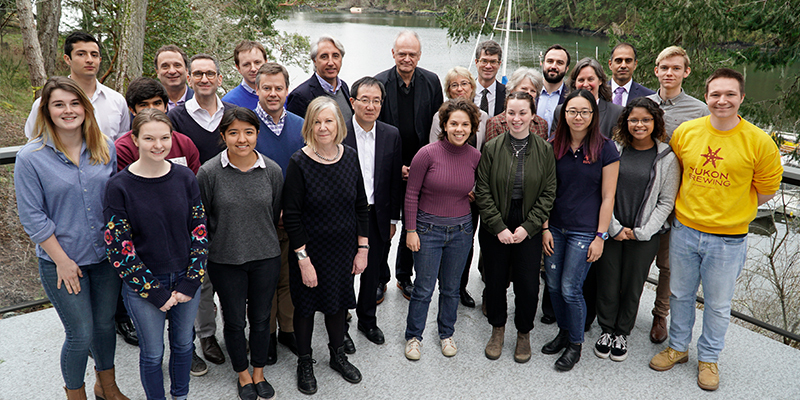 One of the themes of the 2018 G7 is “working together on climate change, oceans and clean energy.” As part of the 8 March Oceans Roundtable discussion, Marine Sciences Teacher Laura Verhegge was invited to deliver a presentation as a member of an expert panel. With her second-year class looking on, Laura made an impact using visual aides including plastics refuse gathered by Pearson students from ocean waters close to our own Pedder Bay. Hosting a high-level, on-campus meeting like this was a reminder of the recognition and respect accorded to the students and alumni of Pearson College UWC who are working to fulfil the United World College mission around the world. It was also an important opportunity for some healthy discussions, debates and even disagreements within the Pearson community itself. I was pleased to host two post-G7 listening sessions during which several members of the community shared their thoughts and concerns about the realities of how the “culture” of this type of diplomat-level international organization meeting this differs from our own more informal campus atmosphere. Discussions also touched upon opportunities for even greater student interaction in any future on-campus meetings of this nature as well the appropriateness of the term “Sherpa” in the G7 context. I salute the students who organized February’s wonderful TEDx Day, “On the Flip Side”, with outstanding speakers – including some of our own students – who encouraged the eager audience to take a step away from the collective opinion by exploring the flipside to the traditional perspective. It was an fascinating, thought-provoking, event. I also want to thank the team who worked so hard to develop and deliver this year’s thoughtful, dynamic and engaging Village Gatherings. One important outcome of the January gathering was the creation of a community working group (students, faculty and other stakeholders) to examine our educational model and programming. How can Pearson innovate and adapt its educational model in order to reconcile our status and aspirations as a UWC while meeting the rigours and realities of the IB? Across the spectrum of student initiatives, I would like to single out the very popular workshop led by Yousra Alfarra (YR43/2018, Palestine) and Hana Fatinah (YR44/2019, Indonesia) on cultural awareness about wearing hijabs. 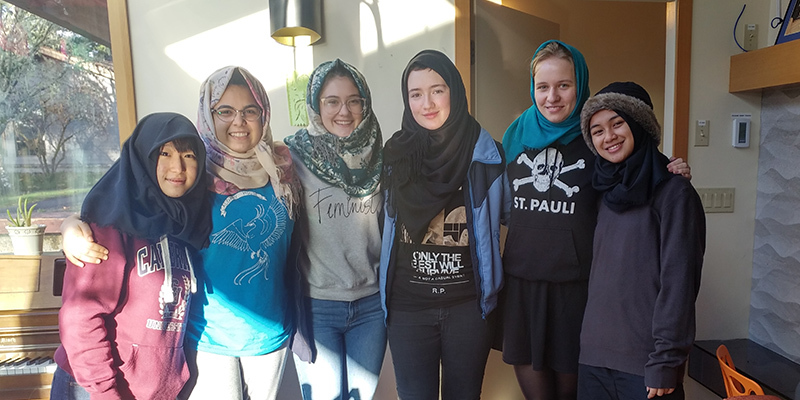 Topics ranged from the hijab in different countries especially Indonesia and Palestine, feminism, why they choose to wear it, and what the Quran says about hijab. I think many workshop participants reflected on the subjects raised by this memorable quote from the presentation: “There is nothing inherently liberating in showing skin, nothing inherently liberating in covering up, the liberation lies in the choice.” Well done! 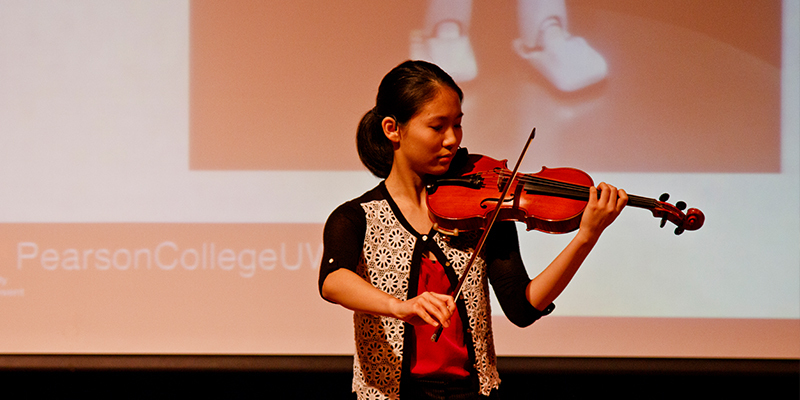 The seminal annual student-led activity is the annual One World Presentation and Student Expo which is an amazing coalescence of the voices, talent and organizational skills of our students from around the world! Following their return to campus after Winter Break, excitement built every day, starting with auditions, and stimulated by intriguing emails requesting all manner of unusual items to be used as props and costumes. One of the most unique requests was for bow ties and wide ties in purple, dark blue, yellow, orange, pink and black! It almost seems superfluous to say, but this year’s One World performances on 16 and 17 March was a breathtaking celebration of diversity through music, stories, dance, and educational displays. On campus, we watched the exciting dress rehearsal two days before the first performance in downtown Victoria and we were very proud to share this with our community in Victoria and throughout southern Vancouver Island. Every single student played an essential role in making One World happen – whether they were on stage in a performance, backstage supporting the players, part of the technical and photography crews or interacting with our guests at the Student Expo. Patrons of the show also had the opportunity to enjoy artworks produced by students that lined the walls of the McPherson Playhouse. So many others in the campus community – faculty, staff, residents and volunteers – are also exceptionally dedicated to an outstanding One World experience. I thank everyone involved. I feel very fortunate in seeing so many of you at this year’s One World Performance and Expo and at the Host Family and friends reception! I know many more of you wish you could have joined at this annual event. Please keep an eye on our social media channels and website for a video of the One World performance to be posted in the coming weeks. This video is entirely shot and edited by a dedicated student photography crew who will be working hard to create a professional-style video to share a professional-style performance with all our eNews readers and especially, family and friends of the performers! Every year, for one week, students head off campus – many staying with our wonderful Host Families — to pursue their special interest or passion in small groups. 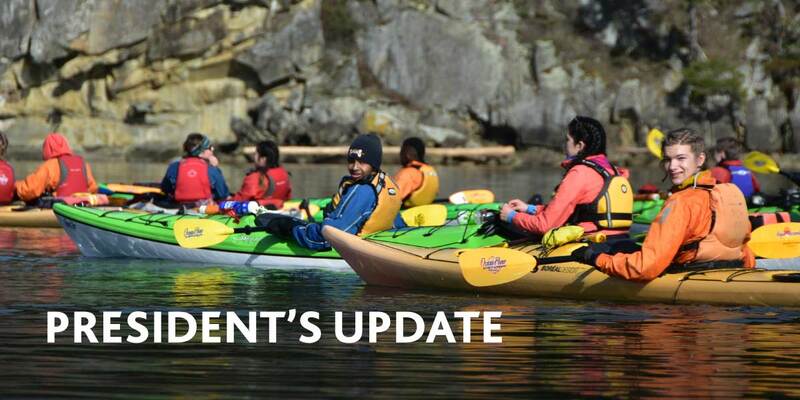 This year’s activities covered a broad spectrum ranging from demanding tests of physical fitness to humbly learning more about our Vancouver Island and Coastal Indigenous communities to working the soil that grows the food that nourishes us all. During an Instrument Workshop, students learned more about and participated in making violins, violas, and mandolins by hand. 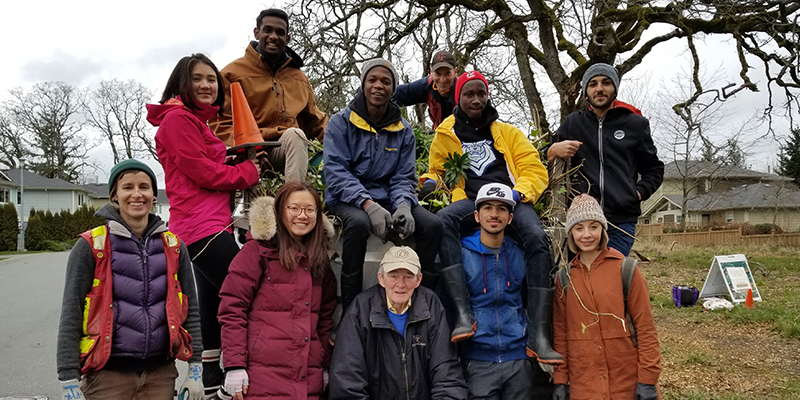 The Invasive Plant Species group removed invasive species at Bruce Hutchison Park while another cadre volunteered on a organic farm on Salt Spring Island between Vancouver Island and the mainland. 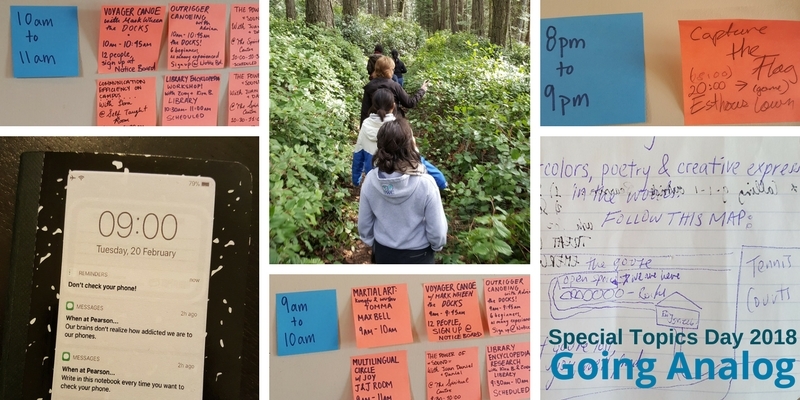 At the History of Cowichan Valley project, students learned about different aspects of Indigenous culture, perspectives on Indigenous integration and also the process of how a community is built. 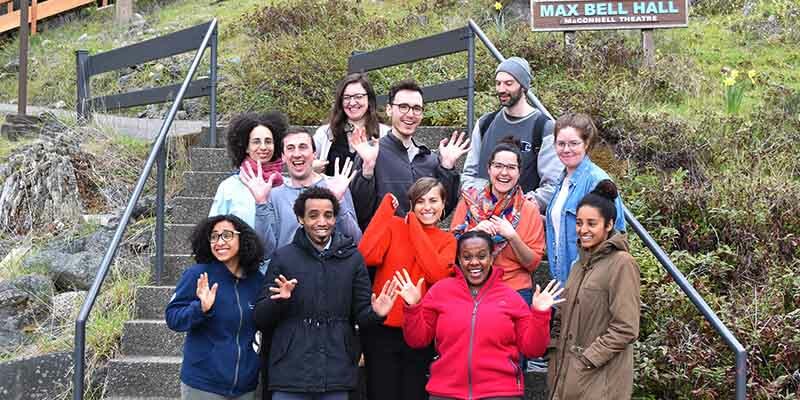 A group of Pearson Politics students was busy with activities facilitated by British Columbia provincial ministries while the Pearson by Design group participated in a workshop of ResiliencebyDesign Innovation Lab. 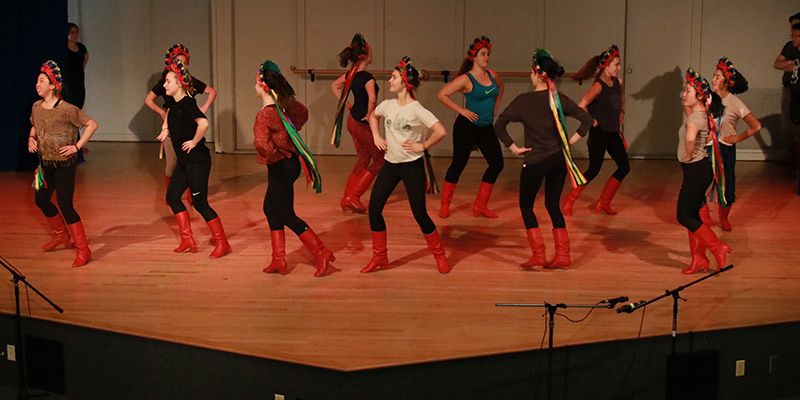 Yet another group went on a 45 km snowshoeing trip along Kludahk Trail while the Gumboot Dance group taught the South African mine workers’ dance at Victoria High School. All students returned safe, sound, exhilarated and sometimes, exhausted! Look for more information and lots of pictures on our social media and in this Flickr album. The final Special Topics Day of the Year challenged students and adults to “go analog.” And, challenging it was for many of us in this era of dependence on our electronic devices! WIFI access was turned off for the entire day, devices were left in student’s rooms and the day’s schedule was arranged on post it notes on a wall inside the cafeteria. Twenty-five Pearson students from our school were invited to take part in a town hall discussion featuring Canada’s Governor General Julie Payette in Victoria on 21 March. Ms. Payette, a former member of the Pearson College UWC Board of Directors and a graduate of UWC Atlantic, made her first official trip to British Columbia as Governor General and made sure that she included a meeting with young people as one of her keynote meetings. Pearson students joined 40 other young people from across Vancouver Island during a session that was designed to give voice to their concerns and offer them an opportunity to ask questions of the Governor General, who is the appointed Head of State for Canada. A big thank you to our own Director of Community & Stakeholder Engagement Benoît Charlebois for working with the Governor General’s office to ensure that Pearson students had this exceptional opportunity. The fellows are 12 young leaders aged 25-30 who come from backgrounds as diverse as education, law, social work, policy, activism, community-building and film-making who have been living and learning together in Montreal for the past eight months as part of the Jeanne Sauvé Public Leadership Program. Together, they hone their skills as cross-cultural and cross-disciplinary thinkers, communicators and collaborators around a common cause. This year’s theme is: Public Leadership for Culturally Diverse Societies – an appropriate fit with the mission of Pearson. At least twice a year, dozens of our students, staff, faculty and residents attend performances of Pacific Opera of Vancouver. On 13 February, 100 people from campus enjoyed a performance of La Bohème thanks to the hard work and organizational skills of Administrative/Admissions (and more!) Coordinator Romaine Bosma. It was a wonderful cultural opportunity for our community and a perfect romantic prelude to Valentine’s Day. Many on campus are already looking forward to the 17 April performance of the final opera presentation of the season, Rinaldo, one of Handel’s most flamboyant compositions. 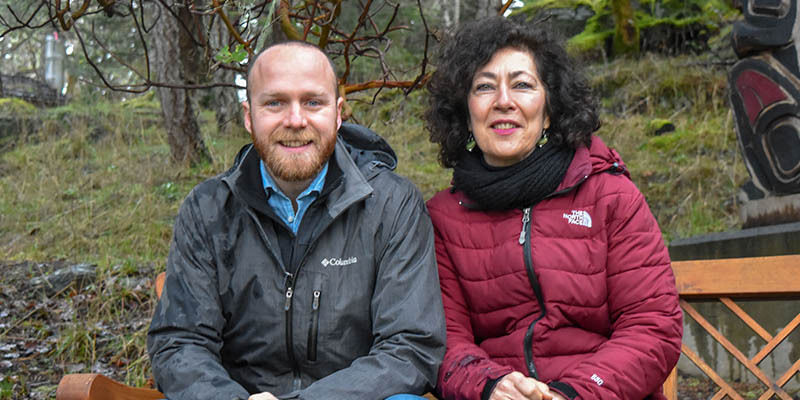 As announced in December, the successful and rewarding Alumni-in-Residence Program began its third year in January with the arrival of two Alumni from Spain, Raquel Moya Agudo (YR 6/1981, Spain) and Albert Luís (YR 24/1999, Spain). Raquel and Albert immersed themselves with classroom and informal activities around the campus and, as always, we greatly appreciate how our alumni give back to current students this way. It is always fun and instructive to interact with our alumni who share their thoughts on Life After Pearson. This term, we have been happy to welcome NYU student and youth leader Kohtaro Kosugiyama (YR 41/2016, Japan), medical anthropologist Vivian Lam (YR 37/2012, Norway) and Stefan Forster (YR 4/1979, Germany) who shared their stories during these informal and candid sessions. If you are interested in sharing your life experiences and perspectives with our students, please contact Alumni Relations Officer Luisa Vasquez. Richard Wise (YR 1/1976, UK) and his co-year, Peter Willcock (YR 1/1976, Canada MB) gave us valuable and delightful insights of the (very) early days of Pearson in their Life After Pearson sessions. Richard, who served on Pearson’s Board of Directors (1995-2001) and on the UWC Board (2003-10) was on campus for several days. He worked with members of Pearson’s leadership team, participated in numerous on-campus activities and gave a very powerful presentation on What it Means to Pioneer, reflecting on his experiences as a YR 1 and challenging today’s students to create their own legacy. Look for Richard’s story elsewhere on our website and the March 2018 edition of Pearson eNews. It is always a pleasure to express our gratitude to the volunteer Host Families who so generously open their homes and hearts to students so far from their own homes. 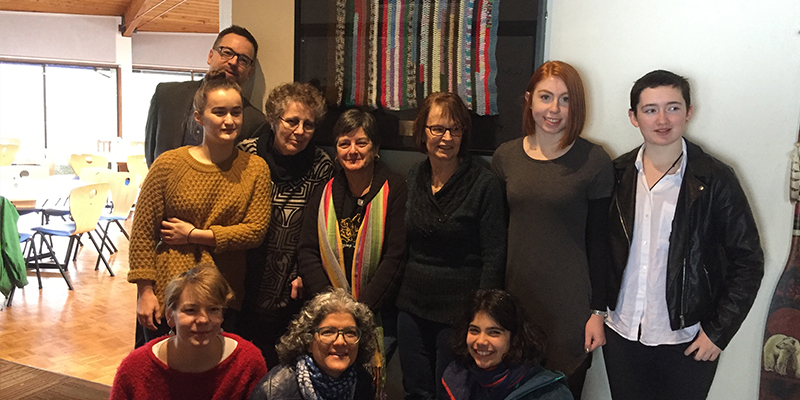 At the February Host Family Brunch, we remembered the late Stefania (Sannee) McFarlane, who contributed so much to the College during her lifetime as a host family to generations of Pearson students and as a driving force in Zonta Club. We were also pleased to offer a grateful shout-out to our Host Families at a reception during the One World celebration that was attended by dozens of volunteers, friends, families and other supporters of the College. Thank you all so much for opening up your homes to our students. Your Canadian family welcome is an important part of their overall Pearson experience. The renovated Student Common Room opened in late January to rave reviews. The students’ patience throughout the process was rewarded with a refurbished and modernized area for relaxation, conversation, music, study and many other activities such as musical cafes. Features include new, energy-efficient windows, new durable and attractive flooring and stage area, a vastly-improved and energy-efficient climate control system, new lighting (LED lights with dimming features), new furniture and infrastructure (café-style counter workstations with USB outlets, spot lighting and comfy chairs – coffee tables; upgraded and modernized electrical outlets, WIFI and A/V support including a new projector) and a new display area for student art exhibitions. I think everyone agrees, this was well worth waiting for and a wise investment to support learning and wellbeing! Now, on to our next big project! McLaughlin House (House #3) will be fully renovated and refurbished during a concentrated period of building activity this summer. McLaughlin House will be the third student dorm residence house to undergo an extensive refurbishment in the last five years. We learned much from last year’s rebuild of Japan House (House #2) that will help us meet our goals of completing work on McLaughlin in time to welcome students in late August. Ty Pile, our indefatigable Vice-President of Operations and Administration, has been keeping the community up-to-date about progress made on the Campus Renewal plan designed to improve the learning and living environment on campus. 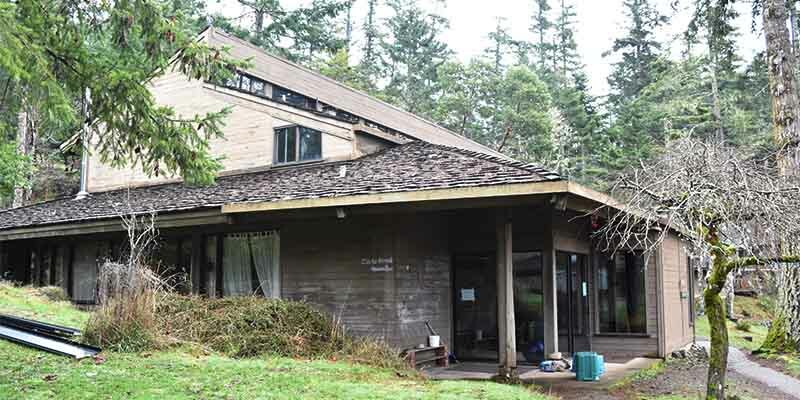 As many of you know, the challenge of maintaining and upgrading our buildings in a West Coast rainforest environment are constant! I do hope you will take a look at the earlier story about the McLaughlin House project and consider how your support through donations help us to renew the environment that helps us attract young leaders from around the world. An important part of my role as president and head is reach out to more and more Canadians and people around the world so that they are aware of the positive roles that Pearson College UWC alumni and students are playing around the world. Our College, as part of the UWC Movement, trains young minds to provide thoughtful leadership in their communities, organizations and countries – something that the world is badly in need of. The message we want to get across to friends and funders (and potential funders of scholarships) alike is a positive, uplifting one – that Pearson students will be prominent among those demonstrating positive citizenship and leadership in future years. Vice-President of Advancement and External Relations Dan Hurley and I brought these messages to government leaders and thought influencers in Ottawa and Montreal over the past few weeks. The Pearson message is being met with enthusiasm and I hope to provide you with further updates in coming months. Dan also took our message overseas during a series of meetings and conferences in the United Kingdom. Dan met with his counterpart officials with the UWC international office and our sister UWC schools and, along the way, also caught up with some of our alumni. Meanwhile, I also had the privilege of attending the most recent meeting of the Board of the Foundation for the Study of Processes of Government in Canada (Forum for Young Canadians). The amazing UWC patron, Shelby Davis, has made a pledge of more than $100 million US towards the UWC movement’s scholarship fund. From 2018 onwards, the donation will provide funding for 100 additional scholarships per year for students from over 150 countries to attend one of the 17 UWC schools and colleges worldwide for their final two years of secondary education. The 100 scholarships will be granted to students whose backgrounds might not otherwise permit them to “dare to dream” of a world-class education like that offered by UWC. Shelby Davis’ donation recognizes UWC’s commitment to further strengthen the diversity of its student body as set out in the “UWC Strategy: 2018 and Beyond”. This goal will be achieved by ensuring that access to a UWC education can be granted independent of each student’s socio-economic means. Congratulations and warmest of welcomes to the five new Heads of UWC Colleges whose appointments were recently announced! We at Pearson join UWC International in celebrating the appointments of these truly impressive individuals who will lead UWC Dilijan, UWC Changshu China, UWC Red Cross Nordic, UWC Mahindra College and UWC Mostar starting in August 2018. Read all about them here. The most recent UWC Heads of College meeting took place at UWCSEA in Singapore (23 to 26 March). Vice-President Education & Programming Heather Gross ably represented Pearson at this gathering. I am anticipating that she will return to campus bubbling with news of best practices, shared initiatives, plans and suggestions of the many ways UWC schools can continue to learn from each other to further strengthen the UWC movement. With less than two months until the end of classes, followed by a short study break and the demanding IB exams, there will be much activity on campus and with that comes pressure on and sometimes stressful days for our students. I assure you the entire adult Pearson community is committed to supporting student mental health and is particularly vigilant during this period. As I stated in my President’s Update of January 2018, we recognize that the pressures on young people today are huge, and we know that at an institution like Pearson, with its demanding academic and experiential curriculum, they can be even more challenging. We use a care team approach to support our students. The student is at the centre of this circle of care – each one is supported by trained peer supporters, their faculty advisor, engaged houseparents, professional health centre staff and counsellors, as well as other trusted adults identified by students. Students who may need more mental health support can always access on and off-campus/community mental health counsellors and services through the campus health centre. I will be updating you as year-end approaches and, in the meantime, I encourage you to follow the news and timely posts on our social media – please check our homepage for links to all our social media channels. Looking forward to speaking with you again soon.